The Yost 10 was was a bit bulkier than its predecessors.The general appearance of the Yost 10 was much more refined than the earlier machines. If you compare the picture of the carriage of this machine with the earlier models, the technical sophistication of this machine is evident at once. The Yost 10 was fitted with celluloid covered keytops all around, which become increasingly brittle as they age and dry. Very few Yost 10s are found with an intact keyboard. 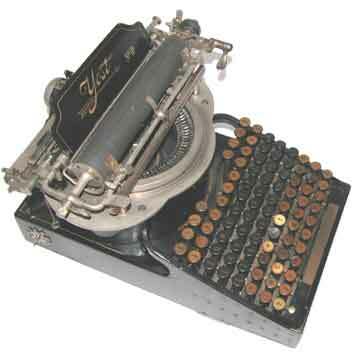 The Yost 10 was replaced in 1908,with a frontstrike visible machine, the Yost 15. In 1912 the last Yost appeared, the Yost 20.